Members of the Flowerdale Community and Flowerdale Landcare are meeting on Sunday, March 1st at the Community House to take part in a Clean Up Australia Day event. Registration takes place at 10:00. The event finishes with lunch supplied by the Murrindindi Shire. Come and give us a hand and enjoy the camaraderie of your community. The kids are doing their bit too. Flowerdale Primary are holding their own Clean Up event tomorrow (Friday). Yes, we are a romantic mob out here. And what could be more romantic than a BBQ and a glass of bubbly in the beautiful bushland setting of Flowerdale Community House. Twenty nine Landcare members and friends enjoyed an hour together in the evening before taking up observation points on the King Parrot Creek from the Silver Creek Road bridge to Moore’s Road, Flowerdale. 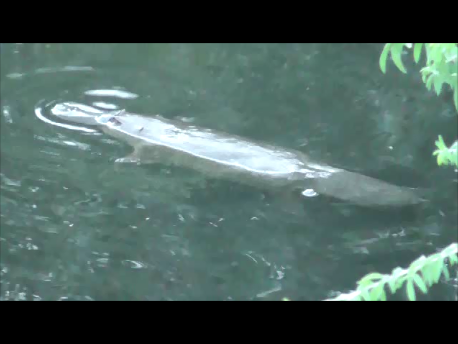 Families and couples spent an hour observing the Creek at 8 sites that were suspected to be good habitat for platypus and the native water rat (rakali). 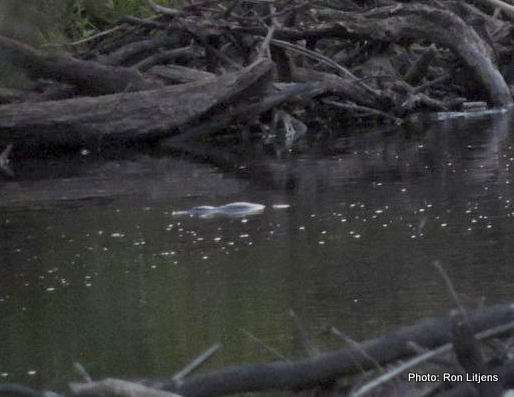 A total of 7 Platypus were seen, including 1 in the Flowerdale township, and 3 together near the Hazeldene Store. Rick W. could not attend on the night but recorded his sighting the day before. These observations were a very good result as the water level in the Creek is a little low after a long dry spell. Some terrific video footage was obtained and will be shown at Flowerdale Community House at our next event. Although 7 children attended this event, none were bitten by bull ants or fell in the Creek this year. We would love to see as many hands on deck as possible. We will meet at the Flowerdale Community House for registration and work towards Hazeldene Store picking up rubbish. Some of this stuff ends up in our Creek after storms and detracts from the habitat that allows Platypus and our iconic Macquarie Perch to flourish. A BBQ lunch will be provided at Flowerdale Community House courtesy of the Murrindindi Shire. Our annual platypus survey continues to grow in popularity with 22 participants up from 19 last year. Members of the King Parrot Creek Environment Group took observation positions upstream from Moore’s Reserve and Strath Creek Landcarers positioned themselves downstream. The survey involves recording observations over a one hour period and making notes every 10 minutes. There were observations that varied from King Parrots and Yellow-tailed Black Cockatoos and fish a’ jumpin’ to 1 platypus sighting and 1 Native Water Rat (Rakali). The water level was down on last year after a very dry summer and may account for the lack of platypus sightings compared to the 5 observed last year. Families are a welcome part of the survey; young Max was very keen to make the most of the experience and after falling in the Creek returned home with the souvenir of a Bull Ant sting for his evening out. 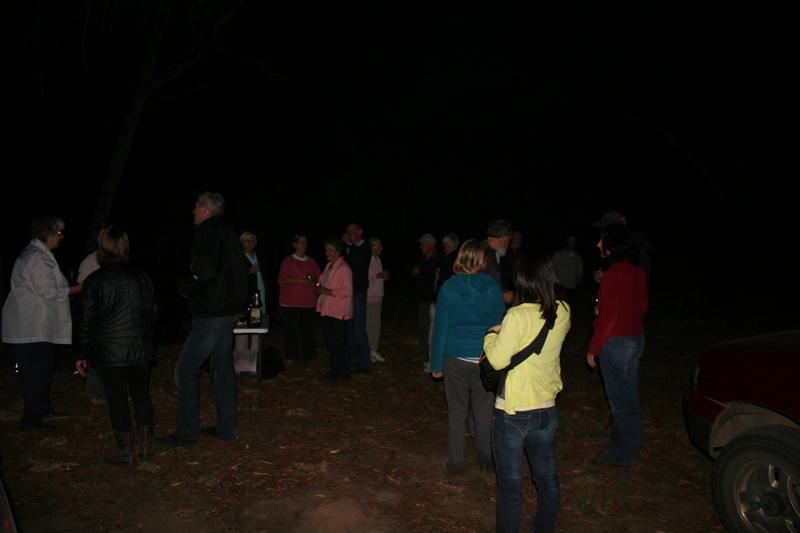 As darkness descended on the last day of summer through the towering manna gums of the Coonan’s Reserve, participants gathered to collate results and enjoy a beverage and snack before a spotlight walk through the bush. A feature of Coonan’s Reserve is a predominance of tree violet understory granting safe cover to small birds for roosting. Several silvereyes and a yellow faced honey eater were seen huddled up within arms reach. This year we failed to spot any sugar gliders or brush tailed possums but we did find one ring tailed possum whilst foraging micro bats frequently flew through the spotlight beam. The night was clear and the stars brightening as we departed the Reserve around 10 p.m. This weekend, members of Strath Creek Landcare will be doing their part in a Clean up Australia Day activity at Strath Creek. Our King Parrot Creek Environment Group engaged in a clean up day on the Australia Day Public holiday. We managed to pick up and bag almost a tandem trailer load of rubbish in the 3km between the Hazeldene Store and the Flowerdale Hotel, before enjoying a BBQ on the banks of the Creek back at the Store. By the time we had finished it was 35 degrees, so we will probably look at running this activity next year in March. The Strath Creek Landcare Group, together with the King Parrot Creek Environment Group, is holding another Group Watch survey for the Australian Platypus Conservancy on Friday 28th February. Hope you can make it – please let us know if you plan to come. King Parrot Creek Environment Group people will meet at the Hazeldene Store at 6.30 p.m., where we will have a quick briefing and distribute data sheets, before heading off to the assigned watching points along K P Creek for a start at or before 7pm. The survey is for one hour, after which we will return to the picnic area in the Upper K P Ck Road side of Coonans Reserve for refreshments while comparing notes, and a short spotlight walk through the reserve. The event is weather-dependent and we will contact you if it needs to be postponed or if there are any changes to the arrangement. Please bring clipboard or similar, pencil, stool, insect repellant, and binoculars and camera if you have them.